Despite that engines play today much stronger than humans, interest in games played between engines is much smaller than games played between humans. Quality is not enough to attract a big audience. Every player will admit that chess played in a competition between humans is many times richer than purely calculating the best move. Besides what is considered as the best move by an engine can even be a mistake in a specific game. I can imagine a situation where the best move leads to a perpetual while a draw is no option due to the tournament-situation. Obviously engines have evolved enormously in the last decades. However if we look to 1990 then I dare to state that engines aren't playing more human today, at contrary. It was in that era that I learned to play chess. In my blogarticle schaakcompositities I already mentioned that I bought a tablet : Mephisto Europa A to practice. Well I believe that I have played hundreds, maybe even thousands of games against it. After I started to win on the highest level of the Mephisto Europe A, I bought the Tandy Chess Champion 2150. Also against that tablet I again played several hundreds of games. Around 1995 I switched to the PC and I played 40 games with a long time control against Siberian Chess and Fritz 2. These gigantic matches were my last engine confrontations as next the door opened to tournament-chess against humans and I never looked again to engine-games. It is evident that this unusual competition lasting for several years had a serious impact on my style. A computer punishes every careless move and doesn't lose the attention. You are forced to be very concentrated during the complete course of the game and you learn to double check each move if it is tactically correct. Prudence is the key to score which generated a big aversion of anything risky. While this approach works well against engines, it quickly appeared to be much less effective against humans. My new opponents spent much less attention to material and were ready to take risks for the initiative or to get compensation, counterchances,... which was totally new for me. Besides I experienced that it was very hard to acquire these new skills as it was fully contradicting my auto-didactic prudent style. In this aspect Jacob Aagaard is right in his comments below the blogarticle Is chess really a young man's game? that engines are bad for the early development of a chessplayer. On the other hand it is clear that practicing against engines is still many times better than no practice at all for the development. In the comments below my blogarticle mijn mooiste zet I already stated that I was aware that improving would require a more aggressive approach of my playing-style. However this didn't go easily. I remember once that I tried an interesting gambit in one of my very first interclubgames in Belgium. I received excellent chances but in the game I didn't use them and suffered a painful defeat. A complete swap from a positional player to a pure attacking player didn't happen but I dare to state that today my game has become more dynamic. I can direct better an initiative which means the risks of investing material have become smaller. In the past Open Gent I played a few nice attacking games of which my game against the German player Olaf Pienski probably best illustrates how I treat today material in a more flexible way. Now I admit that this example is pretty lame for real attacking players. Some players make it even a duty in each game to sacrifice material so they can force their own attacking style upon their opponent. We surely all know players whom fit this description. We admire but at the same time fear these players. 1 Belgian FM whom fits surely in this category is Luc Henris. Twice I had the pleasure to meet him on the board and each time the game was a wild affair. Also in the second encounter Luc surprised me with his better knowledge of the gambit although also this time I have my doubts about the correctness. 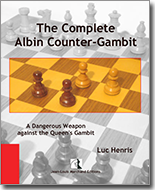 I am curious what is mentioned about the chosen variation of the above game in the recently published book The King's Gambit. Feedback of the readers, bought this book, is surely welcome. That Luc Henris loves gambits can also be seen off the board. Recently he published after years work the colossal book about the Albin-tegengambiet. The book weights 1kg 200 gram and counts 615 pages of which we can deduct that we deal here with an authentic openingbook which explains every detail of what is interesting about the opening. I couldn't find a proper review on the internet of this book but there was some commotion on chesspub about plagiarized work. Seems you can find some pages literally in an earlier published work while no references are shown in the book. I also find this annoying as you could already read in my earlier blogarticle sos. However at contrary with my story, the publisher was willing to apologize which prevented further escalation. It is evident that today there is still a lot of interest in gambits. Players are aware that nobody can play like Houdini (if we exclude vals spelen). Gambits differ us from the engines. It is not mandatory that it should be fully correct as long it creates problems on the board for our opponents so they make sooner or later a mistake.